There’s one thing we know for sure. We put our time, energy, and our money towards the things that we value. But what happens when our values are incongruent with our consumption behaviors, placing us in danger of missing out on the freedom associated with living the life of our dreams? 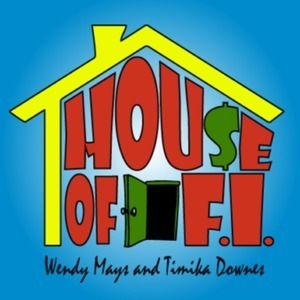 Here to help us explore the intersection between the KonMari Lifestyle and Financial Independence are co-hosts of the House of FI podcast - Wendy and Timika. House of FI helps families who dream of retiring early, but are unsure how to do so AND raise a family, figure out a plan. Their guests share their journey to financial independence, early retirement, and debt freedom. The end goal: How do you know when you've reached FI? Timika's favorite FI tip: Wendy's meal planning tips; Refinance your mortgage to a lower rate when appropriate to free up money for debt pay off; Get a roommate, move from a single family home to a multi to generate rental income, or buy a car that's not brand new. Use travel credit cards to generate reward points. What sparks joy for Wendy: Launching House of FI! What sparks joy for Wendy: Launching House of FI!! To hear more from House of Fi, check out their podcast via houseoffi.com or connect with them on Facebook. After catching up on their latest episodes, leave a review of House of FI on iTunes for a chance to win a copy of Kids Money Habits by Amy Koit. "...essentially, setting yourself up so you're in a position to have choices." "People are also beginning to think more about how to optimize their lives so they can do more things that bring them joy on a regular basis." "The idea that you have to be extremely frugal to the point of deprivation is one myth." "When you add it all up, you see the huge mound of money that's exiting your bank account; just like I saw the huge mound of clothes that my three year old climbed on top of when we put it all in one place and went through it one by one." "What is it that you're doing this for? What are you going to retire to? What does financial independence look like?" "It's really being more intentional about our money...the balancing of each financial decision..really sticking to the goal." "Don't be an island. Make sure that you're connected with other people and a community."